Specialties: Custom (Swedish/Deep Tissue), Thai Massage, Scar Tissue Release Therapy, Pregnancy Massage, Japanese Zen Facial Massage, Couples Instruction, Hot Stone Massage, Aromatherapy, Reiki and Reflexology. Leah uses her intuitive ability combined with musculoskeletal and energetic knowledge to customize a session to your needs. She focuses on stress reduction, chronic pain relief and rehabilitation through deep tissue massage, stretching, positional release, energy balancing and heat therapy. Leah may incorporate OrthoBionomy, gentle positional release technique, into your session to calm your nerves and encourage your bodies innate healing capacity. Leah graduated from The Cleveland School of Massage in 2004 and Potomac Massage Training Institute in 2007 and became a Certified Massage Therapist (CMT) through Virginia's State Board in 2007. She studied over 220 in classroom hours of Thai Massage Training. She founded the Metta Center in 2009 in hopes of providing her truly customized therapeutic sessions to a wide range of clientele. She became an Ortho-Bionomy Associate in 2016 and is continuing her practitioner training program. Leah became fascinated with healing through massage at a young age. She learned more about massage through her mom's guidance as she taught her how to get rid of "knots" through pressure and kneading of the tissue. Upon graduating with a Bachelor of Arts in Anthropology from Beloit College, it became clear that her true calling was in a field that affected people's lives directly through the healing touch of massage. Specialties: Custom (Swedish/Deep Tissue), Reflexology, CranioSacral, Fertility Massage, Pregnancy Massage, Reiki, Hot Stone Massage, Headache Relief Massage and Aromatherapy. Deirdre’s passion is to empower individuals in their healing journey. She brings diverse education, years of experience and life wisdom to each massage session. Described as warm and friendly, she is caring and compassionate in her massage sessions, using her hands to “listen” to the body. Treating the body as a whole, she believes in working with the body to find out what it needs to heal. From personal experience, she understands how chronic pain and stress impacts a person’s quality of life. During her multi-modality massage session, she utilizes techniques from Swedish massage, neuromuscular therapy, meridian therapy, reflexology, craniosacral and Reiki. Additionally, she has specialty training from Nurturing the Mother® in fertility, pregnancy and menopause massage. Deirdre graduated from the Fuller School of Massage Therapy in Virginia Beach in 1996. She re-certified as a massage therapist in 2014, at the Northern Virginia School of Therapeutic Massage. Before discovering her passion for the healing arts, she spent eight years as a litigation paralegal after graduating with a B.S in Psychology from Southeast Missouri State University. Specialties: Custom (Swedish/Deep Tissue), Pregnancy Massage, Hot Stone Massage, Sinus Relief Massage, and Reflexology. Amy has 14 years of massage therapy experience and it definitely shows through her hands! She has a firm, warm touch that is especially helpful for working out those tough knots in your neck and shoulders. She began her massage career in 2004 by studying at Miller Motte College in Wilmington, North Carolina. Once she became licensed through the state of North Carolina in 2006, she spent several years working in the spa industry. She became certified to practice massage in Virginia in 2013. Amy’s intention is to quiet the mind to allow the body to restore its natural balance and harmony. Through deep relaxation she helps the clients let go of everything else and be in the present moment. Amy’s clients describe her work as a full sensory experience. Her massages are fluid and effective with strong technique and every session is catered to a client’s specific needs. She specializes in Therapeutic, Deep Tissue, Prenatal, and Hot Stones with each session leaving the clients blissfully relaxed. Her personal philosophy on massage is: Take care of your body and your body will take care of you! Cat has been practicing massage therapy since graduating from the National Massage Therapy Institute (NMTI) in 2002. 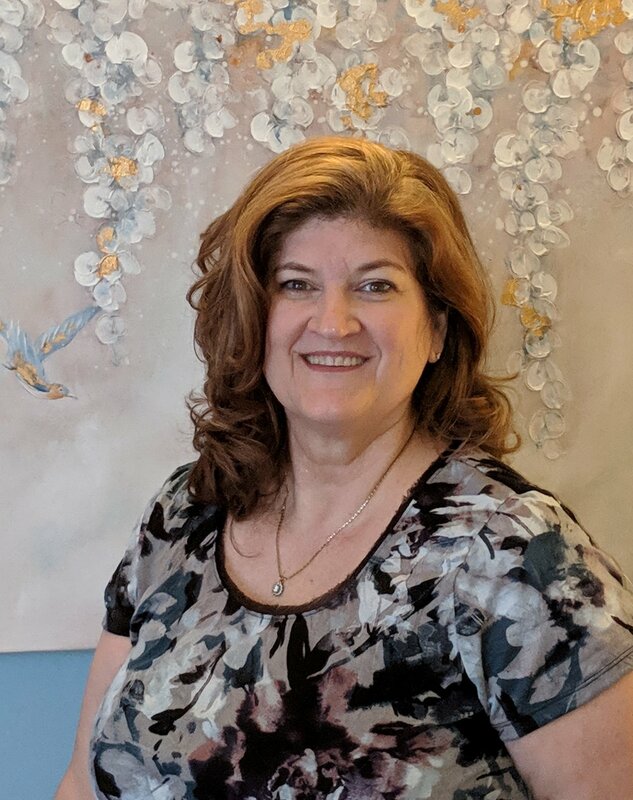 She has been a professional member of, and certified through, the National Certification Board of Therapeutic Massage and Bodywork (NCBTMB) since 2007; and she is a Licensed Massage Therapist (LMT) certified by the Board of Nursing in Virginia. In addition to her technical training in multiple massage modalities, Cat is an intuitive therapist who allows her instinct to guide her through each session, based on the unique needs of each client. Within a single session, she might incorporate Swedish, Myofascial Release, Deep Tissue and Reflexology techniques, as well as some energetic methods, such as Reiki and Transverse Release. Her massage style is fluid and rhythmic. Clients often come away feeling soothed, and possessing a calm energy that will carry them through the rest of their day. Cat is attentive and personable. She aims to provide an environment of comfort and ease to those that grace her massage table. She is a big believer in the power of the connection between mind, body and soul; and she knows that, when all three are in balance, amazing things can happen! She would be honored to assist you on your journey to whole health. Whether you are looking for a light, relaxing massage or a deeply intense therapeutic session, David can provide it. To create the right mix, he blends elements from many different forms of body work: Thai Massage, Swedish Massage, Sports Massage, Myofascial Release, Neuromuscular Therapy, Reiki, personal training, foot reflexology, and breath work. Making things even more interesting, David developed his style in the context of quite a few different massage environments, including: a physical therapy office, a chiropractic office, a spa, a gym, a hair styling salon and a massage studio specializing in Thai Massage. David helps you to cultivate ease in your body and mind with customized, focused massage. Each session starts with a thorough intake to discover your present needs and establish a mutually agreeable massage plan that addresses them. David then engages his creativity, knowledge gleaned from many hours of education and skills gained from ten years of experience to deliver a flowing, effective and uniquely therapeutic massage. After your massage, he checks in with you to receive your feedback and offers you a personalized recommendation for future work, based on his assessment from the massage. David has a calm, accepting demeanor. He is a good listener, and is not especially talkative during massage, though he will communicate quite a bit when working on your specific physical issues. David practices massage because he believes in the power of healthy touch to harmonize and fortify your body and mind. For him, each massage is not just a chance to support you in your life journey. It is also a joyful dance, a mindful meditation on the breath, and the active practice of 'metta,' a Pali word that represents the unconditional wish for all beings to live in health, happiness, safety and peace. Kristine is a Licensed Massage Therapist (LMT) in Virginia, and has qualified as a Reiki Master. In continuous practice since 2004, she specializes in the following massage modalities: Swedish, Deep Tissue, Hot Stone, Sports (with stretching) and Reiki. Kristine is a therapist committed to giving each massage client a customized healing experience. Her massage begins with calming of the mind and a reading of the body. As an empath, this preparation gives her insight into the areas of the client's body which require the most focus. Kristine is versatile in her application of pressure, able to transition from the lightest to the deepest touch within the massage. She has created a modality she calls "Meditative Massage," which incorporates slow touch coupled with energy work to calm mind, body and soul. Kristine takes satisfaction in the completion of her own intense journey of interpersonal healing, which inspired her to help heal others through massage and energy work. She believes we all are connected, and that we all have something to learn from one another.